After installing Password Server for the first time you will need to activate your software with our licensing server. If your Password Server is not currently activated, administrators with the Administer License Status permission will see a red 'License' tab. If the License tab is not visible, visit Users & Roles > Manage Roles and make sure that you have been given the correct Roles which include the Administer License Status permission. Re-activate your License Key -- enter the license key into the input box below and click "Activate"
Click 'Update My License' to have Password Server automatically retrieve a new key from the server and activate it. Restart Password Server after activation to make sure all features are properly enabled. 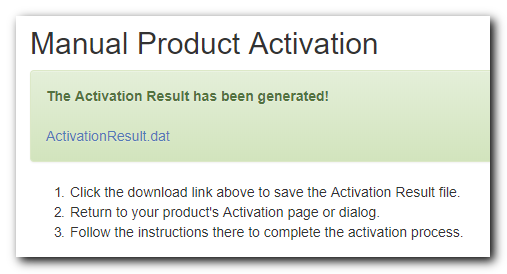 On the License Status page, enter the product key that was emailed when you purchased your license and click 'Activate'. Password Server will verify the key with our servers and your licensed features will be enabled. The licensing accommodates the use of the same Password Server license on another machine for the purpose of: migration, failover, backup, or testing. It is not necessary to de-activate the license on the old machine. If you do receive a message regarding over-activation, please Contact us with details. If your Password Server cannot connect to the internet, see Offline Activation below for instructions. It could be that there has been a connection interruption in the network, and we would recommend re-trying again, at a later time. Please double-check the steps, then if this still does not succeed, proceed to use the Offline Activation steps below. If you continue to experience any problems with this process, please contact Pleasant Solutions for Support. Download the ActivationRequest.dat from the following page. Do not navigate away from this page, as you will need to upload your Activation Response to it in order to complete the process. Transfer ActivationRequest.dat to a device that can connect to the internet. Problems Activating? See this section above. Users who have upgraded from versions before 7.1 will need to perform a one-time license key migration. Before you can active PPASS, you will need to convert your old license key to the new format. Now continue on to Upgrade My License above, for more information.